How big is the national debt? A piece from marketplace.org has this visual, displaying a huge number. The huge number is the current national debt of the United States government. How big is this number? It is essentially 20 followed by 12 zeros (ignoring the digits 555,465… for now). One followed by 6 zeros is one million. One thousand millions make one billion. So one followed by 9 zeros is one billion. One thousand billions make one trillion. So one followed by 12 zeros is one trillion. So the national debt is currently over $20 trillion. The 2016 population count in the United States is about 323 millions. The per person share of the debt would be almost $62,000 for each man, woman and child in the United States. The headline numbers in the news in the last several days are not about the national debt. Instead the focus is on the volatility in the stock market, both here and abroad. The Dow had the largest single day drop yesterday in its entire history. The plunge in the stock market is the likely the result of a domino effect. The plunge is partly due to the potential interest rate hikes anticipated by investors. Why interest rates are expected to increase? The US government is expected to borrow about a trillion dollars this year, up 84 percent from last year. The increased borrowing is to pay for the tax cut enacted at the end of 2017. Borrowing this much more money means that the government will pay more in interest. The Congressional Budget Office estimates that the government will spend at least $5.6 trillion on interest in the next decade. This means that the government will have even less money available for things that improve the economy, for example, infrastructure projects. The huge appetite in borrowing by the government will jack up the interest rate. The US government needs to sweeten the deals by paying higher interest rates. With the government competing for funds, the costs of borrowing for consumers and businesses will increase. Businesses may find it harder to acquire needed capital for expansion. Consumers may have to pay more interest for financing car and house purchases. The recent stock market drops are partly due to the government having to borrow more money. The plunge may also be fueled by indication of higher inflation in the horizon, as a result of employers having to pay more for workers and having to increase prices for their products (the rosy report on wage gain came out last Friday). Hence the stock market turmoil. The number that is 20 followed by 12 zeros is hard to comprehend. Learning how to appreciate such numbers can help us better navigate our economic lives. One place to keep track of the going on in the market is www.marketplace.org. The visual for the national debt is a screen shot from this piece. See this piece from the Peterson Foundation on the national debt. The largest known prime seems to be updated about once every two years. On December 26, 2017, the newest largest known prime number was discovered. The prior discovery was in January 7, 2016 (it was found by a machine on September 17, 2015 but no human took note of it until January 7, 2016). Like the previous largest prime, this freshly found largest prime number is of the form . That is, it is a power of 2 minus 1. In particular, the for this new largest prime is 77,232,917. So the number is obtained by multiplying 2 by itself 77,232,917 times and subtracting 1. This number consists of over 23 million decimal digits (23,249,425 to be precise). 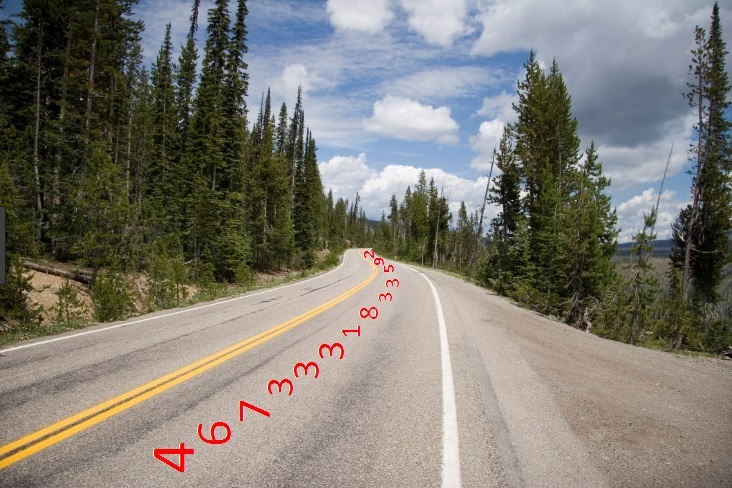 If writing 5 digits per inch, all the digits of this prime number would cover a stretch of highway over 73 miles in length! That’s only 5 miles under the distance of three marathons. The previous largest prime number that was discovered in January 2016 consists of only about 22 million digits (22,338,618 to be precise). These would cover about 70.5 miles. So the newly discovered largest prime number would stretch out a further distance of about 2.5 miles! Here’s the first 120 and the last 120 digits of this new largest prime number. Any prime number of the form is called a Mersenne prime, in honor of the French monk Marin Mersenne, who studied these numbers more than 350 years ago. The latest largest prime is a Mersenne prime. So is the one before that. In fact, most of the record largest primes are of this type. There is a large worldwide community of volunteers who devote their free time in hunting for Mersenne primes, called Great Internet Mersenne Prime Search (GIMPS for short). The prime number is the 50th known Mersenne prime. Its discoverer, Jonathan Pace, is a GIMPS volunteer for over 14 years. The recent discovery is exciting news. The discovery of such a large prime is akin to the scaling of a new and higher Mount Everest. The even more exiting news is that there are plenty more Mount Everest waiting to be discovered and scaled. Euclid proved around 2000 years ago that there are infinitely many prime numbers. Theoretically we know there is no such thing as the largest prime. When we speak of the largest prime, it is only the largest prime number verified by the computing resource that is currently available. For more information about the latest new largest prime, see the website for GIMPS or Google the Internet. The news of this new discovery is reported in this piece from npr.org. A piece in a companion blog has a basic discussion on Mersenne primes. It now takes longer for a Powerball jackpot winner to emerge. There are fewer jackpot winners, but the jackpot sizes are getting bigger. Powerball ticket revenues are way up as people are excited about the giant Powerball jackpots. What we are witnessing is the result from a redesign of Powerball game. The redesign is succeeding spectacularly for the Powerball authority. For the Powerball players, what do they get? The odds of winning the jackpot are getting longer. Should they do something else with their money instead? This post aims to highlight another side of the Powerball equation. Prizes in the Powerball lottery are alluring. There are prizes for $4, $7, $100, $50,000, $1 million and of course, the grand prize (the jackpot prize), which nowadays is in the hundreds of millions of dollars. The largest Powerball jackpot that was ever won (to date) is a whopping $1.58 billion on January 13, 2016. Even though the grand prize attracts the most attention, the smaller prizes are also designed to be attractive. With the power play option, the $1 million prize can be turned into $2 million and the prizes below $1 million can be increased by up to 10x. So the $50,000 prize could potentially become half a million dollars. The attractiveness of Powerball is part of an overall strategy to drive ticket sales. The strategy is so successful to the detriment of the Powerball players who plunk down tens or hundreds of dollars every week in the hope of winning $1 million or more. The Powerball lottery has drawings twice a week, every Wednesday evening and Saturday evening. There are winners in every drawing (these are the smaller non-jackpot prizes). However not every drawing produces winner(s) of the Powerball jackpot. In the most recent 5 Powerball drawings, only one produced a jackpot winner with the amount of $758.7 million. For the preceding jackpot winner, you have to go back to June 10, 2017. The Powerball rules were revised in 2015 to make winning of the jackpot much less likely. Under the new rules, the odds for winning the Powerball jackpot are one in 292 million (1 in 292,201,338 to be exact). Since the inception in 1992, the odds for winning the Powerball jackpot had been increasing in a dramatic fashion. Prior to the most recent revision, the odds were 1 in 175 million, which are long odds for sure but are dwarfed by “1 in 292 million.” As a result, it is less and less likely that a drawing will producing a jackpot winner. There are 292,201,338 many different 6-number Powerball combinations (5 numbers for the 5 white balls plus 1 number for the red Powerball). If all 292,201,338 combinations are chosen by the Powerball players, then there would be for sure at least one winner of the jackpot. But 292,201,338 is a huge number (see here on how the number 292,201,338 is derived). For example, the entire population of the United States is 321.4 millions in 2015, with 248 millions of them age 18 or over. If every adult in the U.S. purchases a Powerball ticket, it is still possible that there will be no winner of the grand prize (but there could be a few $1 million winners). Locating a person by randomly picking one person from the U.S. adult population would have easier odds than for winning the Powerball jackpot. If the context of U.S. population is not sufficient to convince you, here’s another way to appreciate how big 292 million is. Look at this graphic from WSJ. The piece strives to illustrate how vast a quantity 292,201,338 is. Just to scroll the page over that many dots is a near impossible task. The odds for winning the Powerball jackpot are mathematically zero (being 1 in 292 millions). That is precisely the strategy of Powerball. With no winners of jackpot over weeks and months, the excitement for Powerball is turned into a frenzy. As a result the jackpot usually keeps building until it reaches the “hundreds of millions” range or the “1 billion” range. The rules were designed to rachet up the excitement and as a result driving up sales. So the most recent jackpot winning of $757.8 million and the $1.58 billion in January of 2016 are no accident. They are in a sense manufactured. This point is also discussed in this piece from Washington Post. Of course, it is not necessary for every one of 292,201,338 Powerball 6-number combinations to be purchased in order to produce a jackpot winner. Nor is it a feasible proposition (see this piece from Forbes on this point). The selection of a sufficiently large proportion of these combinations is sufficed. But for that to happen, the excitement has to be intense enough to draw people in. This is the case in the drawing on August 23, 2017 when the jackpot was over $700 million. Who wouldn’t be excited by the prospect of winning 0.7 of a billion dollars? The subsequent drawing on August 26, 2017 had a jackpot that was starting over (roughly $53 million). Naturally, there was no jackpot winner in that drawing. The pattern is clear. When the jackpot is small, there is not sufficient excitement to drive ticket sales and there are usually no jackpot winners. Then the jackpot accumulates to a sizable amount (say hundreds of millions of dollars or more). Once sufficient number of people are drawn in due to the huge jackpot, a winner or winners will eventually emerge. Frequencies of Powerball jackpot winnings are hard to come by. The Powerball winning numbers are widely available. But the winning numbers by themselves do not tell you whether someone won the jackpot. A remarkable web page is found that lists all Powerball jackpot winners from 2003 to the most recent winner on August 23, 2017. There are 175 Powerball jackpot winners in this 14-year period, giving an average of 12.5 winners per year. This is not the whole picture. Let’s see how these 175 winners are distributed across the years. The most telling part of Figure 2 is that there are only 7 jackpot winnings in 2016 and 5 winnings in 2017 through August. The Powerball revision occurred in October of 2015. 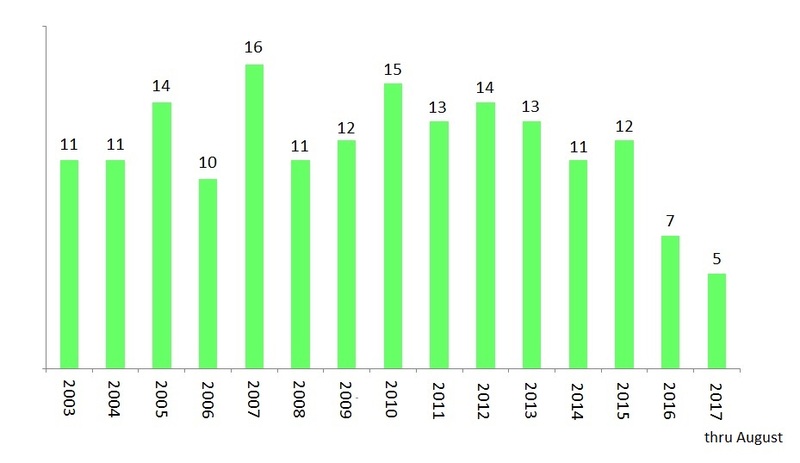 In the years through 2015, the annual frequency of winnings ranges from 10 to 16, with an average of 12.5 a year. Then it drops off significantly to 7 a year in 2016, the first year after the Powerball redesign. How much was paid out for the jackpot winnings in these years. 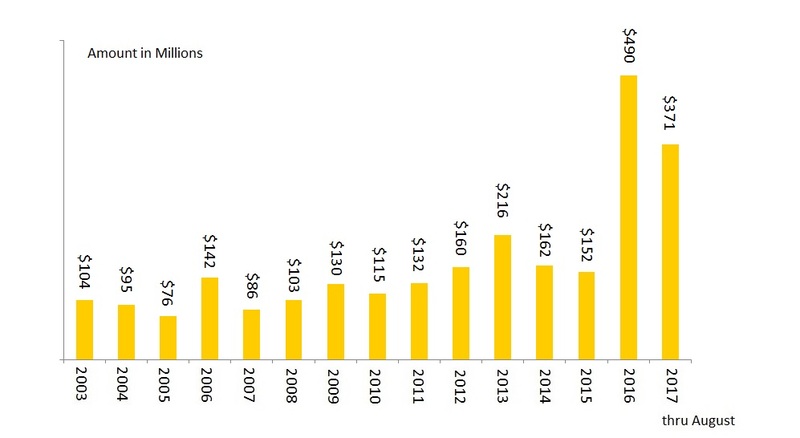 The following bar graph shows the total payout for the jackpot winnings by year. The total amount of winnings for the 7 jackpot prizes in 2016 is $3,431 million or $3.4 billion, the most telling part of Figure 3. 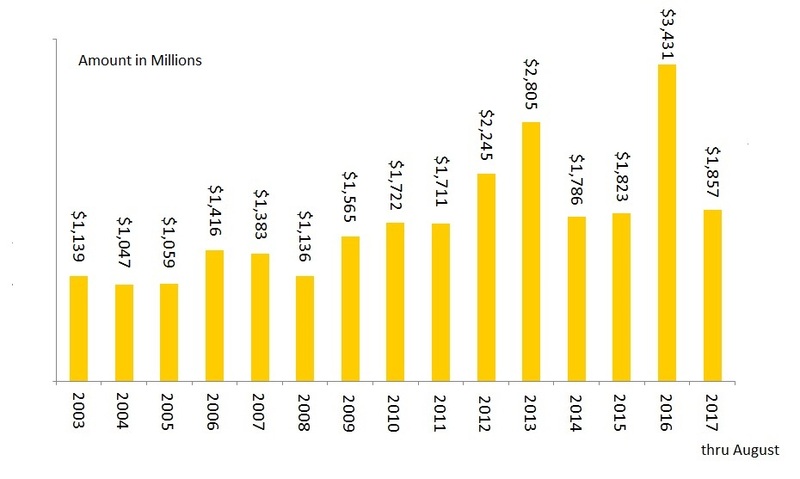 The total payout per year for the prior years was in the 1 to 2 billion dollars range. The payout amounts are a function of the total ticket sales. So 2016 is a banner year for Powerball. Clearly the redesign is working. The rule redesign is clearly giving the sales that they were looking for. The next graph shows the average payout per jackpot. Note that the average jackpot in 2016 is $490 million ($10 million shy of half a billion). The 2016 average is pushed up by the $1.58 billion jackpot winning in January of 2016. Combining 2016 and 2017, the average jackpot payout would be $440 million, way higher than the previous averages in the $100 to $200 million range. So in the new era of Powerball, the jackpot payouts are huge and there are far fewer jackpot winners. The following shows the jackpot prizes won in 2016 and 2017. The business model of Powerball clearly is working for the folks who run Powerball. Ticket sales are way up. Players are excited about the game. What’s in it for the players? Playing Powerball is an excellent entertainment. With a $2 admission price, you can dream and fantasize for a few days. Once a week habit would be about $100 a year in entertainment cost. Buying one ticket per drawing would be a $200 a year habit. Regular customers of Starbucks would spend more than that amount on coffee in a year. Of the regular lottery players, roughly the top 5% spend a few thousand dollars a year (a hundred thousand dollars on average in their lifetime, assuming no interest) for an illusive chance to win $1 million or more. What if these regular players invest the money elsewhere? If they invest the money instead on a conservative fund earning 2% a year, they would accumulate an nest egg of hundreds of thousands of dollars. Assuming a rate of returns at 2% a year, investing $3,000 a year for 40 years would yield approximately $185,000. In fact, if they invest in a broad base stock market index (e.g. S&P 500 index), they would do even better in the long run. The long run historical S&P 500 returns are around 10% a year (7% after inflation). Assuming a rate of returns at 7% a year, investing $3,000 a year for 40 years would yield around $640,000! Playing Powerball for $3,000 a year would mean buying 30 tickets a week, 15 tickets per drawing, assuming playing 50 weeks out of 52 weeks in a year. The top lottery spenders would pay this much or more in a year. The number $640,000 may seem like a pittance comparing to a Powerball jackpot or even the smaller Powerball prize of $1 million. Even in the rare chance that someone wins $1 million, the winning is taxed and the after tax amount could be $600,000. Thus the rates of return of a lifetime investment in playing lottery are not as great as people imagine. Without winning, the lifetime lottery investment of a few thousands dollars a year would be money going down the drain. For a more detailed discussion, see this piece from Washington Post. 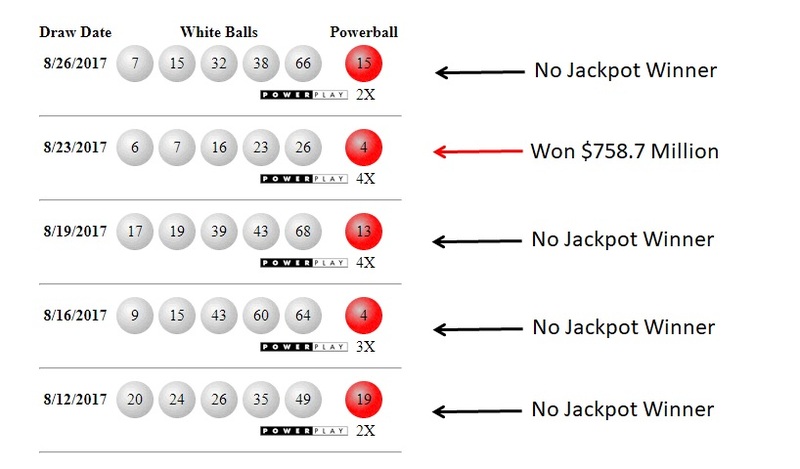 The calculation of the Powerball winning odds is a great math lesson. Rather than looking at the winning odds, perhaps it is more instructive to look at losing odds. The odds for not winning the Powerball grand prize (per $2 bet) are 292,201,337 to 292,201,338, which are essentially 1 in 1. Blog posts on lottery are some of the most viewed posts in our affiliated blogs. See this piece on Powerball and the lottery curse from a companion blog. It has links to other blog posts on the topics of lottery. Probabilities are a curious type of numbers. If properly understood, they can help us see the world around us in an appropriate context. Sometimes these numbers can be counterintuitive and downright confusing and sometimes misleading. This article from The Atlantic presents 5 classic problems in probability that can help us think better in probability and statistics. Some of these problems confounded experts. It pays for anyone to pay attention to these problems. These 5 problems are the Monty Hall problem, the birthday paradox, Gambler’s ruin, Abraham Wald’s memo and Simpson’s paradox. One common characteristic to all these problems is that they are in some sense paradoxical. The facts on the surface can lead us down one path to a wrong solution. On the other hand, the correct result can be so counterintuitive that it seems absurd. Take the Monty Hall problem for example. When it appeared in a column authored by Marilyn vos Savant in Parade Magazine in 1990, it drew a great deal of angry responses from readers, some of whom were holders of PhDs on math and statistics (they said so in their disparaging responses). These experts in math and statistics all claimed that the solution proposed by vos Savant was wrong and she should know better. Some of these angry remarks are repeated here. These experts were wrong! It turned out that even experts can be confounded by probability numbers too. As a result of the controversy, the Monty Hall problem is a probability problem that is known widely and is covered in most standard introductory texts on probability and statistics. The Monty Hall Problem: The Remarkable Story of Math’s Most Contentious Brainteaser, a book entirely on the subject of Monty Hall problem, is authored by Jason Rosenhouse (Oxford University Press, 2009). Refer to the above link for a quick introduction to these 5 problems. Three of the problems have been discussed in several math blogs affiliated with this blog. The following are the links to these blog posts. The following blog posts discuss other classic problems in probability. Two more discussions of the Coupon Collector Problems are this one and this one. Two more discussions on the Birthday Problem: here and here. How often does this kind of violent removals of passenger happen? No often. In fact, the video became viral almost instantly. United Airlines is suffering in the stock market and in the sphere of public opinion, both domestically and abroad, even as far as China. Dao is ethnic Chinese. Many netizens in China wonder whether Dao was chosen to be ejected because of his ethnicity. There is a talk of boycott of United Airlines in China. We do not know how United Airlines determines the passengers for removal or denial of boarding. We will come to this point shortly. Here’s another good question. How often are airline passengers removed from airplane or denied boarding airplane? Often enough. In fact, airlines have the legal right to remove passengers from the plane or deny a passenger from boarding the plane for any reason, including to vacate a seat to someone else. In the case of Dao, he was removed to make space for an airline crew member. Though the violent outcome shown in the video is extremely unusual, the mere fact that passengers are booted off the plane to make way for others is not unusual. The airlines industry minimizes the involuntary removals by offering bribe in the forms of cash and free hotel stays. In United Flight 3411, the passengers were offered such incentives. Then the cash incentive was doubled due to the lack of response. Then eventually four passengers were randomly chosen to be removed. Dao was the only one of the four selected passengers who refused, citing that he had to go back home to treat patients. Come to think of it, being denied boarding or being removed is like a lottery. The lottery ticket is the airline ticket that you purchased. The payout of the lottery is that you will reach your destination later than the scheduled date/time if at all. There is monetary payout for sure, from a few hundreds dollars to a thousand dollars possibly with hotel accommodation (only if you take the bribe). Such lottery is conducted all the time since it is perfectly legal for an airline to overbook. As a result, some “lucky” passengers will be kicked off the flight. If no one takes the bribe in the form of cash/hotel stay, then they select “winners” at random, another similarity with the usual lottery, though it is not known how random the selection is. What are the “winning” odds in this lottery? According to Department of Transportation numbers, some 46,000 people were “involuntarily denied boarding” by major airlines in 2015. Out of how many “lottery” tickets sold? According to the statistics from the U.S. Department of Transportation’s Bureau of Transportation Statistics (BTS), U.S. airlines and foreign airlines serving the United States carried an all-time high of 895.5 million systemwide in 2015. The odds are 46,000 to 895.5 million or 1 in 194,674, roughly 1 in 200,000. The “winning” odds are pretty good in comparison with the usual lottery. In a generic lottery where the winning combination is 6 numbers chosen from 49 numbers, the odds for winning are 1 in 13,983,816, roughly 1 in 14 millions. A better comparison is with a smaller lottery. For example, the odds for winning Fantasy 5 in the California lottery are 1 in 575,757, with the odds almost three times longer than the “denied airline boarding” lottery. California lottery’s SuperLotto Plus has winning odds of 1 in 41,416,353 (roughly 1 in 41 million). For Mega Million, the odds of winning the jackpot are 1 in 259 million. The United passenger David Dao left the plane with a bloodied face and spent times in the hospital in Chicago. It seems that Dao won the jackpot of the “denied airline boarding” lottery. The incidence was widely reported in social media and in many online news outlets. Here’s a piece from npr.org. No one wants to win this lottery. Here’s a piece, also from npr, on how not to get bumped and what to do in the event that you are bumped. Here’s a piece on the tone deaf response from United Airlines on the incidence, an indication that they are losing the PR battle. The following is another video. The title of the post is pizza. But the real story is actually hamburger patties. Knowing how to cut a pizza, or rather knowing the relative size of a slice of pizza will make the story about beef patties interesting. The cutting of the pizza is shown in the following pictures. This is a whole pizza. Only one slice. The relative size of a slice is 1. Cut the pizza in two equal slices. The relative size of a slice is one-half or 1/2. Cut the pizza in three equal slices. The relative size of a slice is one-third or 1/3. Cut the pizza in four equal slices. The relative size of a slice is one-fourth or one-quarter or 1/4. Put the pizza slices together from the smallest to the largest. From the last picture, it is clear that one-third of a pizza is bigger than one-fourth or one-quarter of a pizza. The same relativity would apply for other things too. One third of a loaf of bread would be more than one-fourth of the same loaf. Sitting at the doctor’s office waiting for one-third of an hour would be a longer wait than sitting there for one-quarter of an hour. One-third of a gold bar would be more valuable than one-quarter of a gold bar. At this point, I hope you agree that one-third of any thing is more than one-fourth of that same thing. In particular, one-third of a pound of ground beef would be more meat than one-quarter of a pound of beef. A hamburger patty weights one-third of a pound would contain more beef than a patty that weights one-quarter of a pound. According to this article in New York Times, many people think the opposite, that one-third pound of beef is less meat than one-quarter pound of beef! The article is a long one about math educational reform efforts in the United States. The following are the two paragraphs relevant to our discussion. The participants in the focus groups believed that 1/3 is a smaller number than 1/4 because the 3 in 1/3 is smaller than the 4 in 1/4. How about the public at large? The fact that the new one-third pounder of Whataburger (the parent company of Whataburger is A&W) was a commercial flop while the new burger was favored at taste tests makes it plausible that this was indeed arithmetic failings on the part of the American consumers. There are two take-aways. One is arithmetic. The fraction 1/3 is bigger than the fraction 1/4. Or put it another way, the fraction 1/4 is smaller than 1/3. This is visually demonstrated in the series of pictures above. The fraction 1/n refers to the situation of dividing one unit of a thing into n equal pieces. More dividing means each fractional piece is smaller. You can view 1/n as the division of one thing among n people. The more people in the division, the smaller each share is for one person. Thus when the number n in the denominator 1/n gets larger, the smaller the share each person would get. In the pizza example, the more people want to take a share of the same pizza, each person would get a smaller piece. With one million dollars shared by 2 people, each person would get half a million dollars. But with one million dollars shared by one million people, each person can only get one dollar! Again, when the denominator gets larger, the fraction become smaller. Another way to know the relative size of a fraction is from using a calculator. One divided by 4 gives 0.25, while one divided by 3 gives 0.3333. Note that 0.25 is smaller than 0.3. The other take-away is that this example is a vivid example of what author John Allen Paulos called innumeracy, which is the mathematical equivalence of not knowing how to read. In fact, he authored Innumeracy: Mathematical Illiteracy and its Consequences. This book is a good read for anyone who wants to improve his or her numeracy or for anyone who wants to understand the issue of innumeracy. It is not a cure for innumeracy, but is a good start. The New York Times article mentioned above is authored by Elizabeth Green. Here’s another NY Times article that discusses the article by Elizabeth Green. Hidden Figures is a 2016 biographical drama based on a book of the same name. The movie celebrates the work of three mathematicians/engineers/computer programmers whose work helped propel America into space and win the space race against the Soviet Union. It garnered positive reviews from critics and has been nominated for numerous awards. Scientists and mathematicians are not hard to find in a place like NASA, currently as well as in the time period in which the story took place (1950s and 1960s). What set these three individuals apart is that they were female and African Americans. They are Katherine Goble Johnson (played by Taraji P. Henson), Dorothy Vaughan (played by Octavia Spencer) and Mary Jackson (played by Janelle Monáe). Thus this movie touches several dimensions – race, gender, history of the space race, and of course the gripping human stories of these three individuals as they struggled to excel in an endeavor they were not expected to excel in. Math is not just the backdrop of the story; it is front and center in the movie. Of course, the movie does not delve into the details of the math (if it did, it would not gross $129 million worldwide). But the movie is a story of the triumph of math. The math equations worked out by the central characters helped make the space flights safe and successful. There is another sense that it is a story pf the triumph of math. According to this piece from The Atlantic, math at one point in time was the province only for those who were white and male. Johnson, Vaughan and Jackson and other human computers (later turned mathematicians and engineers) at NASA were allowed to play a pivotal role in the space program because of their math prowess. In fact, due to the societal stereotypes and racial biases of the time, they would normally not even be hired in the first place. Katherine Goble Johnson was a child prodigy and for a while her talent was underutilized. Then her moment came when NASA needed someone who had skills in geometry and could apply the skills in the calculation for flight trajectories in the Mercury program. The stake was obviously high. NASA was under tremendous pressure to catch up with the Russian. Wrong or inaccurate calculation could mean loss of life and national disgrace. This tension is best dramatized in a scene in which John Glenn wanted to have the numbers checked by the girl (i.e. Johnson). As Glenn was about to be sent off for his orbital mission in 1962, Glenn insisted on having Johnson run through the equations to make sure the trajectory was safe. Here is a post that focuses on the mathematical achievements of Johnson. So math is an equalizer. These mathematicians and engineers had a seat at the table because of math. This is an all around wonderful story. This article from Scientific American gives more information on the mathematical and programming work of Johnson, Vaughan and Jackson. This is a piece from NASA on human computers. Math is as much of an equalizer now as then. I hope the movie inspires youngsters to pay more attention to math and science. Math makes space travel possible. Anyone can learn and excel in math. A whole new realm of possibilities is awaiting for the next generation to explore and unlock. Due to the popular movie, the story of Johnson, Vaughan and Jackson is now well known. A lot of results come up from Googling their names and the movie. Here’s one piece from Forbes. Here’s the Wikepedia entry about the movie. Here’s two articles (here and here) from npr.org.